Get open for better shots on the basketball court by learning to move effectively without the ball. Moving without the ball is one of the most important aspects of basketballâand an area often overlooked by players. Practicing effective moves without the basketball develops great offensive skills. The overall goal of these moves is to get in position for the best shot possible. Below are examples from Kansas Basketball Academy FoundationÂ to help you develop into a complete offense player. Moving without the ball is one of the most important aspects of basketball—and an area often overlooked by players. Practicing effective moves without the basketball develops great offensive skills. The overall goal of these moves is to get in position for the best shot possible. Below are examples from Kansas Basketball Academy Foundation to help you develop into a complete offense player. This diagram shows the various moved players can make in different areas of the court. The Backdoor Cut is effective when the defense overplays the passing lane. The offensive player starts toward his or her teammate with the ball, planting the foot farthest from the basket, pushing off, and cutting hard toward the basket. Players must provide a target for the passer. The player on the perimeter cuts toward the lane, plants hard on the outside foot and cuts hard back to the perimeter to receive the pass. If you're guarded and standing still, you won't get open to receive a pass. Change speed or direction to get open. Learn about moves after the V-Cut. This move can be made up the lane or down the lane (from the wing position.) Use footwork similar to the V-Cut. Cut with a quick stop, pivot toward the ball, seal the defender on your back side and receive the pass from your teammate. A post player or a strong tall guard who has a size advantage over the defender can cut inside, but instead of cutting back out to the perimeter, he or she can quickly pivot and explode to the ball for a post-up move and a pass inside. 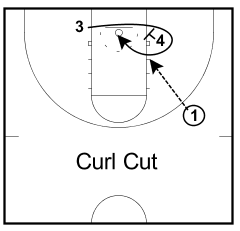 The Curl Cut is running a circular cut around a teammate's screen. It is an effective move without the basketball for shooters to get open for a pass and shot. 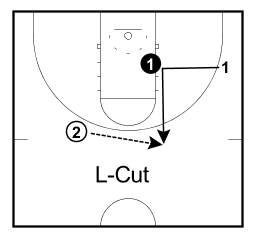 Shooting guards can go inside and curl-cut around a post player to get open. The cutter must learn how to use the screen and read the defender. If the defender chases around the screen, the offensive player should curl. If the defender goes under the screen, the offensive player should fade or flare out to the perimeter for a jump shot. Learn more about the basketball motion offense.